In protest to the obligatory hijab law, six Iranian women walked into public and removed their head covering, waving it for all to see. They followed protests by one woman who, on December 27th, was arrested for removing her hijab in solidarity with the White Wednesday campaign. Creator of the campaign, exiled Iranian journalist and activist in the United States, Masih Alinejad, reached out to Iranian women through social media via a website entitled My Stealthy Freedom; the website posts images of women consensually removing their head scarves, with a demand for an end to the compulsory scarf law. Lawyer and human rights activist Nasrin Sotoudeh added, “It’s obvious that some women want to decide for themselves what to wear.” It seems that the public response to the Monday protest was not particularly negative. People applauded her, taxi drivers and older women took her picture while the police either did not see her or chose not to intervene. Of the six women who protested on Monday, one was arrested for removing her head scarf. During the protest, some women waved white scarves, a symbol of Alinejad’s campaign. 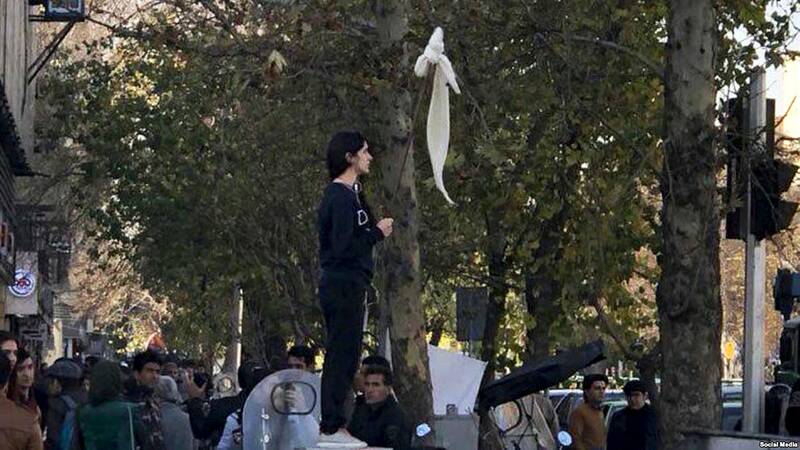 Another woman stood in the same spot where, on December 27th, Vida Movahedi was arrested for removing her head scarf; the protester was wearing a green ribbon, a likely supporter of the oppositional Green Movement. While discriminatory practices in divorce and inheritance laws poses major problems for individual women, the head scarf is a highly public symbol, imposed upon the population by Iran’s clerical leaders; only they can decide the appropriate clothing that people can wear, what music they can listen to and which movies and televisions they can see. The laws affect both men and women. For example, men are unable to wear shorts in public. Both men and women have been arrested for violating the conduct laws. Under current president Hassan Rouhani, the morality police have largely been removed from the streets. The protests are not a protest of the hijab, but a protest against the demands of controlling a woman’s body and the choices in what she decides to wear in the public sphere. They are protests against a government that censors women’s choices and wants to manage what they wear and where they chose to express themselves. That phenomenon is not exclusive to Iran. The United States censors and disciplines girls deemed to have made `inappropriate’ clothing choices. Girls have been disciplined for showing their collarbone and shoulders. African American students have been penalized for wearing their hair in braids with extensions and have been suspended until they change their hairstyle or barred from prom, as happened to Mya and Deanna Cook last year in Malden, Massachusetts. These cases and laws will continue to garner the appropriate outrage, because it is not a case of oppressive measures by outside countries for religion that has been negatively generalized. They are laws designed by men to make women and girls feel ashamed of themselves and regulate their clothing and, above all, their bodies.